Celebrating the life of Stanley Ciupak, Jr.
Be the first to share your favorite memory, photo or story of Stanley. This memorial page is dedicated for family, friends and future generations to celebrate the life of their loved one. Obituary for Stanley Ciupak, Jr.
Stanley Ciupak Jr. was born on September 8, 1937 in Detroit, Michigan. He was the oldest child of the late Stanley and Francis Ciupak. 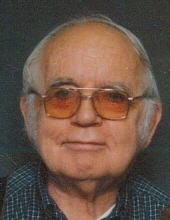 Stanley passed away on April 5, 2019 in Commerce Twp, Michigan at the age of 81. A friendly, hardworking man, Stanley work the line at the Ford Livonia Transmission plant in Livonia for 30 years. He retired in 2000 to spend more time with his family. Stanley enjoyed retirement. Often, once the weather broke, he and Barbara would travel to their place Up North, where Stanley could be found enjoying the fresh air and scenery, typically on his riding lawnmower. Stanley was the loving husband of Barbara for 51 years. Cherished father of Ruth (Marvin) Williams, Robert Millsap, Christine (Yasyuki) Ueno and Diana (Brian) Marciniak. Proud grandpa of 10 and great-grandpa of 12. Dear brother of Charlotte (Paul) Isabel and the late Arline (David) Sevener. Stanley’s life will be celebrated with a Memorial Service on Tuesday, April 9, 2019 at 12 noon, at Lynch & Sons Funeral Home, 340 N. Pontiac Trail (3 blocks south of Maple Rd) in Walled Lake. Friends may visit the funeral home beginning at 11 am. "Email Address" would like to share the life celebration of Stanley Ciupak, Jr.. Click on the "link" to go to share a favorite memory or leave a condolence message for the family.